So here’s the scenario: I was at Tractor Supply the other day, and ran across a young lady and her father. We struck up a conversation and I learned that she’s in the fabrication business and has a hard time hiring welders that are productive. Then she said that welders are lazy. For me, the problem is that I don’t normally hang out with welders, and I’ve never worked in a shop where there was more than two or three, and pretty much all of the welders I’ve worked with have been pretty ambitious. However I’ve never worked with welders who fit the mold of “normal,” so I really didn’t know how to respond and still don’t. My problem is that I really need to expand Amerivet Services to accommodate the growth of the business. I need a plan that suits the current economic situation and allows me to hire people to fill certain strategic positons and hopefully take a little load off my back. I started Amerivet Services during a recession and there were skilled people here and there that could fill short-term needs and all was good. Now that times seem to be better, those skilled people (who apparently aren’t lazy) all have full-time jobs. So now I’m in a self-induced pickle: I’ve entered the busiest part of the year without a strategic plan that suits the current flow of business, and there’s a significantly reduced pool of useful candidates to fill any potential position. This is my own doing because I’m over-cautious. I tend to shy away from situations where I stick my neck out too far. It’s important that I preserve this business, even if I sacrifice a little growth in the process. The memory of my friend Mike telling me that I provide an essential service echos every day, and he said it three years ago. I do provide an essential service, and that service provides me with the essential situations that I need in order to support the unique needs of my unique self and family…situations you won’t find with a regular “job.” Beyond that, I have a set of talents that are hard to break into pieces and farm out to other people. The unique nature of my Air Force career field guarantees that, and the unique things I learned as a child reinforce it. So I’m stuck with this big unique question, and the answer is that I need to find someone who isn’t lazy, who has the same work ethic as me, and is willing to learn. The military taught me that it’s important to train people to replace me, and it’s apparent that that situation will never go away. I do need to teach people my talents, my work ethic, and my management style. All three have been very successful inside and outside the military, and a few people need to learn them while I’m young. So, what do I desperately need around here? I would like to talk with some young person who’s in welding school and might like some part time work, though I’m not 100% certain that I have a substantial amount of work that’s at a fabrication “shop” level, so this is still a thought that I need to work through and decide whether it’s time for me to purchase another welding machine to put on the road (and figure out what that business model will look like)..
And keeping with where this story started and my thoughts accordingly, it’s important that whomever I hire have a work ethic that’s compatible with my own. They’d have to have a sense of “duty,” “integrity,” and “excellence,” reinforced by a strong sense of customer service that follows my own. AND, quite honestly, lazy people shouldn’t waste their time applying. Where do I find this person, and what job will they have? How long will that position be available? What will they earn, and what benefits will they have? Honestly I don’t know at this minute, but I’m sure I’ll figure it out soon. It’s the single biggest problem at this moment. 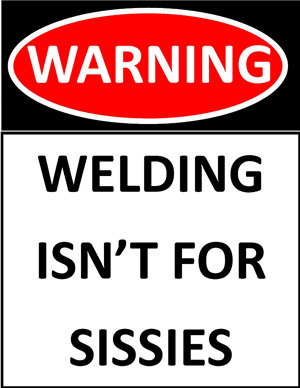 Until then, Amerivet Services is open for business, and I guarantee no welder working here is lazy or ever will be.